Emperor Napoleon I invaded Russia with his Grande Armée on June 24, 1812. The enormous army, featuring more than 400,000 soldiers and staff, was the largest European military force ever assembled to that date. 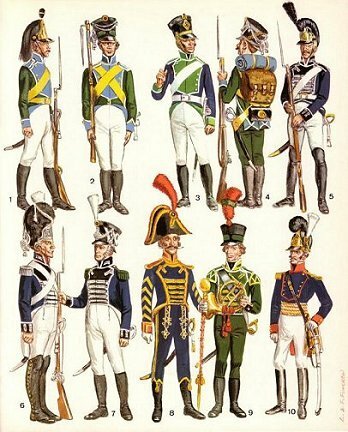 The army was comprised of French, Polish, Italian, Dutch, and German troops. The invasion was triggered by the refusal of Tsar Alexander I to support Napoleon's continental blockade of Britain. ​​During the opening months of the invasion, Napoleon was forced to contend with a bitter Russian army in perpetual retreat. Refusing to engage Napoleon’s superior army in a full-scale confrontation, the Russians under General Mikhail Kutuzov burned everything behind them as they retreated deeper and deeper into Russia. On September 7, the indecisive Battle of Borodino was fought, in which both sides suffered terrible losses. On September 14, Napoleon arrived in Moscow intending to find supplies but instead found almost the entire population evacuated, and the Russian army retreated again. Early the next morning, fires broke across the city set by Russian patriots, and the Grande Armée’s winter quarters were destroyed. 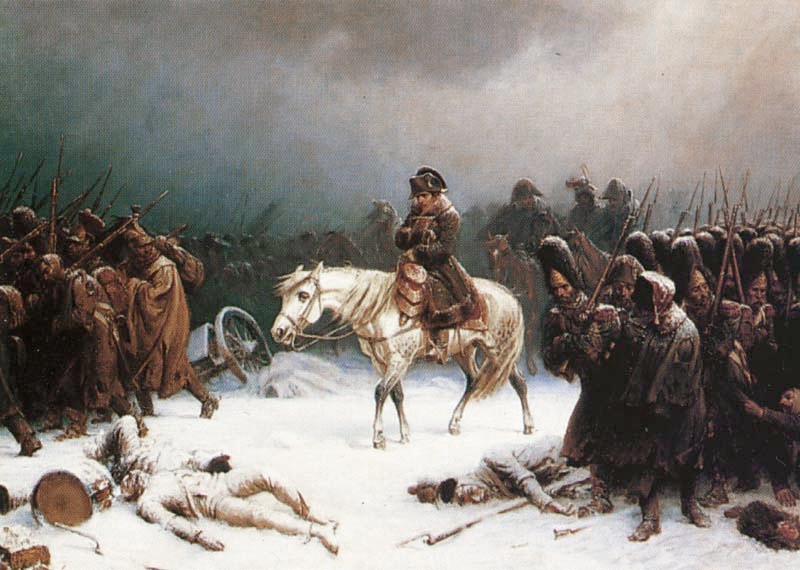 After waiting a month for a surrender that never came, Napoleon, faced with the onset of the Russian winter, was forced to order his starving army out of Moscow. "Napoleons retreat from Moscow" by Adolph Northen (1828–1876). Licensed under Public Domain via Wikimedia Commons. Russian archival records document that 181 of Napoleon's soldiers were resettled in the Volga German colonies. These men either deserted the decimated Grand Armée or were captured by the Russians. Two of these soldiers, twenty-year-old Michael Alexander, and thirty-six year-old Friedrich Palm, were captured and resettled in the colony of Norka in late 1812. It is probable that both men were born in German speaking areas of Western Europe. Michael Alexander married Anna Maria Lorei, the daughter of Johannes Lorei (also Lorey) and Anna Margaretha Weigandt (also Weigand). Michael was recorded in both the 1816 and 1834 censuses taken in Norka (Household 119). By 1834, he and Anna Maria had six children: Christina, Johannes, Katharina, Peter, Wilhelm, and Elisabeth. A seventh child, Georg, was born in 1835. Michael is not listed in the 1857 census and it is presumed that he died before this date. Anna Maria is living with her sons Johannes, Peter, Wilhelm, and Georg and their families. Friedrich Palm is recorded in the 1834 Norka Census (Household 404) with a notation that he died there in 1829. No other household members were listed and Friedrich has no known descendants. In hindsight, Michael Alexander and Friedrich Palm were fortunate to be captured and settled in Norka. Nearly 90 percent of Napoleon's soldiers did not survive the invasion of Russia. Belousov, S.V. "Prisoners of war of Napoleon's army in the Volga region: the arrangement, content, relationships with the local population." Bulletin of the Samara State University. Samara, Russia. 2006. No. 1. pp. 48-55. Online 19 June 2018. Mai, Brent Alan. 1857 Census of Norka in the District of Saratov, Russia, Dated 21 January 1858. Beaverton, OR: Dynasty Pub., 2008. Print. Norka Personalbuch (Church Family List) 1834-1845. Michael Alexander, Volga German Institute website. ​Friederich Palm, Volga German Institute website. List of Napoleon's 181 Soldiers Settled in Volga German Colonies. GASO, the State Archive of Saratov Oblast.